What a June it has been, and as predicted, we are seeing our finest Hex Hatch in likely seven or more years! 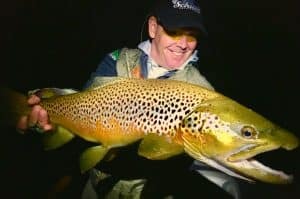 Fishing pressure each year steadily grows with the ease of big fish bounty offered by the floating proteins, but still begs for the most elementary disciplines needed to call ones self a dry fly angler on the darkside. All things considered, it has been some time since my boat has done as many fish over 24” in one hatch as this one passing, water temps being way too high, the last couple of days, I chose to call off my trips unlike some outfits that guide at the fisheries expense! With Da Hex Hatch slipping now, we begin focusing on “THE HUNT” for a goodie, where not only ones cast and mend needs to be in check, but also his prowess in not needing a fish feeding off the oar locks to get the job done… MOUSIN & Terrestrials will take center stage for the next few months, and it couldn’t come soon enough as my boat is stinking of dead Hex. 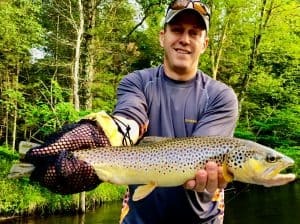 Watch your water temps before fishing… Any temperatures at or over 69 degrees and your killing trout, which is just fine if your planning on eating it, but if you’re a catch and release fisherman or woman… Just stay in the AC till the river rebounds. This has been a very hot June by all standards, and the cool offs on the incoming aren’t that cool. Those browns can live way too long to chance killing them for a single encounter! Hex Hatch 2018 was a dandy… 6 fish at or over 24” in my ship this season last couple/few weeks with almost a few dozen over 20”, makes it the best big fish season on hatch flies in likely as many years! Last years hatch was a bust with the water flows being HUGE, and the year before the cool held back allot of the bugs, but this year, everything was just right… Hex Hatch is a time for someone with little time or skill to put themselves in a higher probability of catching a real trout without the expense of several trips to the river, or even a better skill set to “HUNT ONE UP”. Holding a dead drift up to 15’, with a cast just beyond that, with just a basic hook-set in check are the only prerequisites for success. When a fishes position is known, and even his forage being painfully obvious, with a drunk like feeding campaign, it’s not hard to convert on a fish who’s skirt is so far over it’s head, it becomes almost “Hexementary” in the ease of presenting to a fish of such caliber. 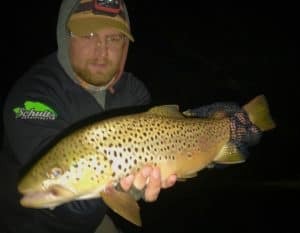 Knowing where the big ones feed comes in real handy, but the thing I’ve noticed most in the boat for better success with folks not used to hearing such a fish rise, is to simply curve the Buck Fever an angler fights while waiting for his bug to be chosen over the thousands floating down. Hook-sets are the end game of presentation, and I feel as if too many people pucker at that moment when a fish has found your pattern; I mean I can actually see their but cheeks tighten up when the shoe drops! Calm down and gather yourself before that first cast… Finesse & Timing are the core disciplines in this great sport, and there is nothing finessed about a hook-set that winds up 20’ in a tree behind us; or a wiffle ball bat like swing that would otherwise have broken the fish off, or if nothing else startled the fish so much it would just assume quit feeding. Much like a shopping spree, one can get caught up in the frenzy of fishing the high pay off, shortened windows, and darkened arena the HEX HATCH offers. 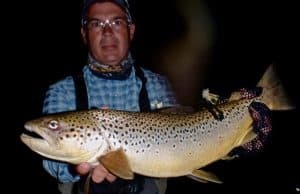 If you have a bad heart… Hex Fishing may not be for you as it is quite exciting hearing such a fish rise with frequency so very close… Which reclusive and larger brown trout are not known to do ANY OTHER TIME! This years’ success has the book already filling for next June… If you would like to participate next year, do give a jingle and we’ll get you in the book for the World Series of Dry Fly Hatches… Hex Hatch 2019! Thanks for a fantastic Hatch folks… Gonna start flipping to the Terrestrial Scene, which includes a mouse, for the next few months. Hex 2018 Is A Wrap!!! Following our bigger hatch season here on the PM… Sulfurs, Grays, & Hex all but in the rear view, we beg for a take without knowing the when and where of it; but cast with the faith needed to convert when it does. ISO are a great way to develop dead drift skills and still keep smaller to average browns looking up all day long right now. 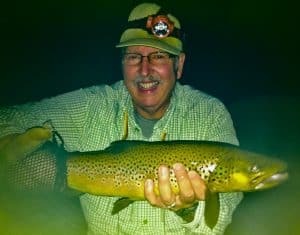 Fattened and light in color, the emerger is a kryptonite for the daytime feed, but should be fished on tippets matched to the pattern itself, but be mindful of the white gloves if the populations shift. 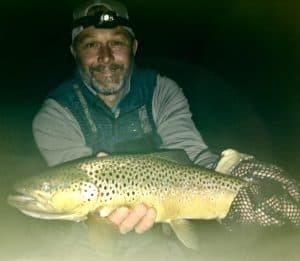 One can get pretty heavy when fishing some of the bigger stones we are, and will be fishing all the way into August, yet fishing the impending Trico is total about face in tippet. Same with terrestrials… Each bug should have a recommended tippet based on the clarity, levels, time of year, and even the size of the bug being fished. 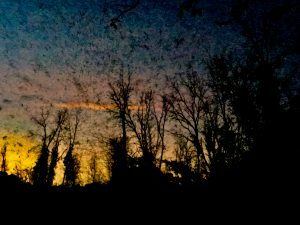 We fish goat rope at night because the light is lower, in the same respect we fish much lighter tippets when the sun is up, but one also needs to consider wind drag when fishing the midday; this because too light of a tippet, on a bigger bug, will cause allot of twist and hassle. Casting and mending are all fine and good, and very much needed, but your rigging should be considered as much about the presentation as the mend itself. Terrestrials have been fishing very well already, and I’m not sure really what doesn’t work if presented far enough away from station, and then fished with proper presentations; because at some point or another, it’s all gotten smacked. Yellow bellied anythings will last until the passing of the Stones, but still pass nicely as a hopper later on with some nice Dave’s Hopper. Spider count on the river this year is impressive, and the damsel fly count is even higher. 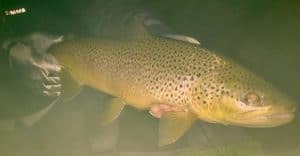 Though considered an aquatic, the damsel is as much or more a terrestrial in its holding pattern, and that point should be factored in once a rising trout has keyed on them. Fun to watch a brown take damsels, and if you do notice one, take the time to watch the acrobatics it will offer in hopes of the smaller looking dragon. Of course oak hoppers are doing very well, and the bigger red legs will be around I’m guessing very soon with all the heat we’ve been enduring this past week. Ants will fish today after a nice popcorn shower we got, and beetles always have their moments. Water temps are terribly high right now, but look to stabilize this week… Till then, give’em a break and let them get through this sketchy period of low O2, this, the hottest summer in sometime. It’s been really great working with all of you in daylight this past couple months, focusing presentation and casting skills. Lately, I’ve had a strong number of my newer clients coming into their groove, and it’s almost like taking the bridal off some of these guys and gals and watching them adapt, with different angles of cast and considerations, to each and every spot. Both on the cross body present, and the forward… It’s been a pleasure watching the lights come on for you folks; it’s what really makes my job so enjoyable! 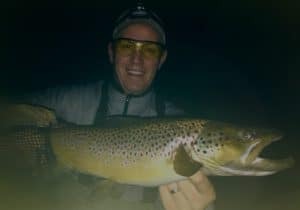 So yeah, the hatch has been so good I’ve been seeing the sun come up plenty with some of the spinner flights lasting as long… But we are coming up on my favorite time of year to be a trout fisherman in this state… Night fishing for canoe battered, light exhausted, clear water hating… brown trout. Normally this time of year will yield the very biggest of trout, though the passing Hex tried real hard to be that guy this year! Hunting waters anything but busy with fishermen or watercraft, we fish to a savvy trout, one that chooses his windows of aggression wisely… And so should we! Following the hatches, typically there is a minor pause and passing of protein before the need to feed takes over again. Sometime around the next dark moon, larger fish will go into debt of calorie and need to make it back anyway they can. 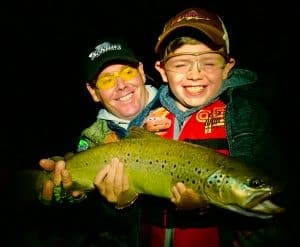 Sneaking up on minnows, crawdads, or other smaller trout becomes exhausting for the larger trout when the lights are on, so naturally they choose a window in which they can hunt… That being the dark of night! Seems to me many that frown on the nighttime practices we engage to better ourselves as anglers, (fishing without as much sight or sense of our presentations, but still delivering a more thought out cast than any could muster in the light of day, where even the smallest lies are well lit and depth perception allows for flawless factoring), would in the same sentence tell you their best windows of chance are at the lowest lights of the day… As an angler, noticing such behavior in the brown trout, known to be a nocturnal hunter, should be jumped on like a grenade. Consider myself more of an evolving angler instead of a stuck in the mud “dry or die”, or the new one, “streamer purist”, angler. If you are keeping up with your adversary, you would know, that not only the light, but the aluminum hatches, which are so very noisy and disturbing, make for very little foraging potential for a predator. It will lie away and wait for things to calm and darken… Much like a recluse wolf, it will choose to hunt at night over the daylight, because his data, like yours, should say that the hunt is possible when the lower lights allow for the fish to gain position off a feeding lane, or ambush point. 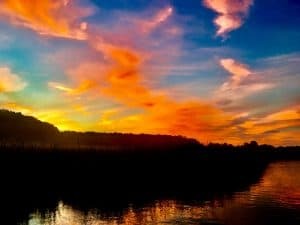 If you choose to fish daylight, and don’t mind less action, and need to stay on a normal schedule and just love the cast of it… Power to you, I do the same from time to time just to stretch the cast. 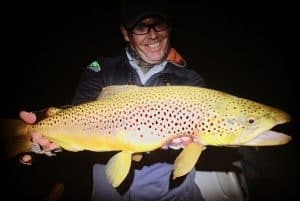 However, if you are a trout angler, much like a hatch fisherman choosing to be in the right place at the right time, and your not fishing the darker ends of the 24 hour with assorted larger terrestrials… You’re not fishing your data so much as holding yourself to a dry or die mentality. 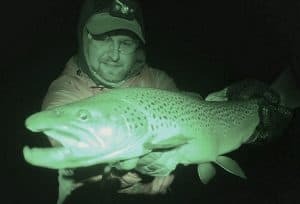 Stretch your comfort zone a bit, and go wade a well known to you section in the dark; I kid you not when I say you will be beyond pleased when fishing to fish that are set up to feed long after the dry or die or streamer purists are fast asleep. 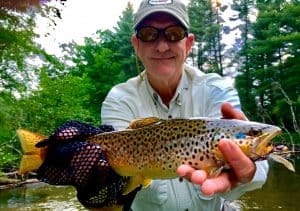 Encourage all types of fishing, as I myself angle all types of fly fishing… Don’t let anyone curve your approach with a fly based simply on the time of day you would fish it. 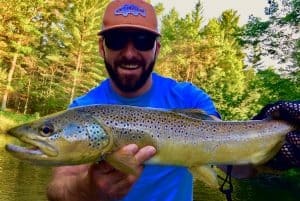 As long as your getting a bite, there is no wrong time of day to have a trout take your fly! If your guide hesitates when you ask for night trip, or adds some politics on why he chooses not too… Give us a shout; we’d love to get you out! 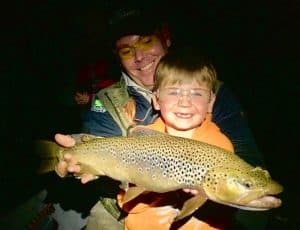 By the way, if they need a light, (on the boat or on their head), to get down the river, you’re likely with the wrong guide as that typically spooks allot of older, wiser trout, and really shows you how little they know the watershed. 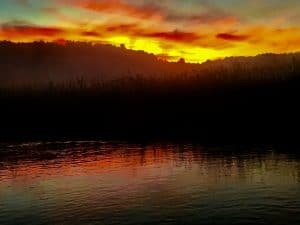 Presentations are a huge part of terrestrial and mouse fishing, and really the only difference in the two is the time of day you might implement them. 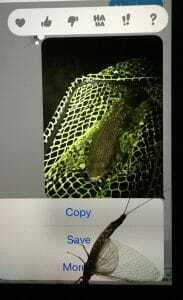 Even fishing a bigger stone fly or smaller caddis could be fished with the same ideals in mind. A blind approach to where a fish might be, with presentation in check for each potential hold, with only a forecasted position of predator versus the reassurance of an actual rise. 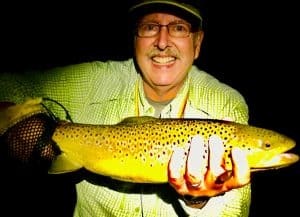 When there is a hatch, the trout’s lane is predictable and very easy to present too, as you are aware of right where it needs to be dead drift. Mice, hoppers, stoneflies, and assorted terrestrials need to in fact be presented correctly over a much larger band. Though egg laying, water walking or skipping, or even the doggy paddle of a mouse are all based on giving life to the pattern; it’s often the moment of dead drift that opens the window for an attack. Much like streamer fishing, where the pause of the higher paced retrieve is sacked, it’s the allowance of STOP that sells a brown enough to really set up and kill the presentation. Stone flies out west can be worked non stop thanks to the trout count and perpetual chop that hides most high sticking maneuvers, where on flattened and slower Midwestern streams you need to give some sense of stealth following the walk or skip to sell the rest of farm. With smaller pockets and ambush points that are tinier, allowing for less chase room, but than longer dead drifts, is the key to converting. With mice the same ideas are in check, but based on the prey and the way it would trek or float down the river. 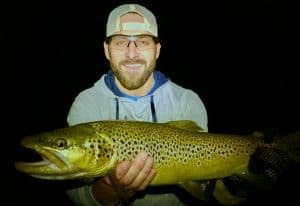 Even when we night fish, it’s not always a mouse when we say mousin… It’s often frogs, muddlers, divers, pushers, and even some smaller ducklings if you are so bold. Fly selection is still in play, but much like terrestrials you could argue, what doesn’t work when the presentation is ahead of the curve?!?! Leaders for daylight and dark are just that… Night and day… Tapering the right rigs gives roll over ease and presentation accuracy that too limp, or to stiff of a leader cannot. Neat thing about fly fishing, is if your evolving with the fishes awareness, you can stay ahead of the curve as a better guide, this instead of monitoring car spot sheets and cut and pasting another mans program, which is more the norm with the younger crews coming up. 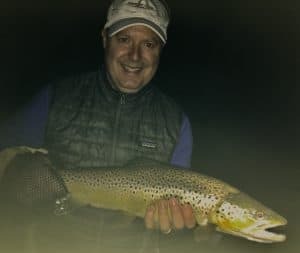 Speaking of which, we had a great finality to a slower evening of bug, with one of my more productive friends/client… Tom Mcgraw has been fishing with me for some time, and to say he has giving it his all might be an understatement. Birthing PMTU, constantly involved in conservation, both here on The PM, but also now Nationally; to say he’s into it is surely and understatement. 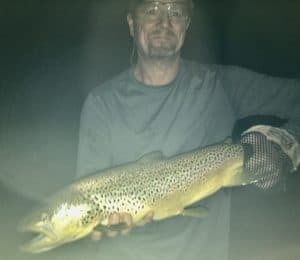 After countless runs on rivers out west, and here in MI, (save a mutant that he scored in Arkansas, which all others on a streamer will be measured against for sometime at 36”), Tom had a big old gap in his Trophy Stepping. Going from very nice to larger trout, he skipped the trophy parts, and tinged the bell as high as you can on a fly… Only to be left high and dry on the Two Foot Barrier, versus the three footer! So many fish landed over 23” with me, and several out west, along with some return runs to Arkansas for the possible repeat of lightning striking him twice, but all for not on his quest since… It’s been a real project getting Tom his due and proper. 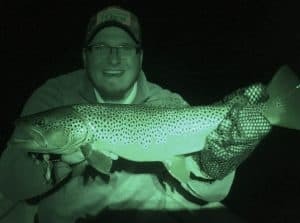 One slower night of Hex this season, where the bugs were weak, and the bite was scarce, Tom got his Two Footer, and a thick one at that. Skills in check for sometime, the fish really didn’t stand much of a chance with such a seasoned angler, but it just goes to show, you never know which night you have to be ready for the happening. Hugs were dealt, and cigars were smoked… T. McGraw broke 24”, this after setting a bar we must all follow with the mutant on the southern front. Good On Ya T… Way To Keep The Faith! On a personal note… And if you just like fishing reports, pass on this next couple paragraphs, as I’m gonna vent a bit here, publicly! It seems apparent to me that local outfitters and lodges are not doing that well in either bookings, or ego, or maybe a little of both. 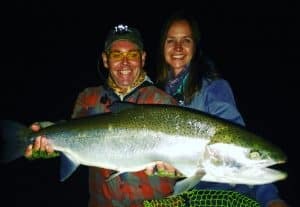 Not to say as fishing guides we all don’t carry inflated heads, but it’s like they like poking the bear, or justifying their need to follow me like a lost dog or maybe they are just mad that I told people the truth about snagging wild salmon and steelhead off their beds, which many still promote as fishing. When I was younger, I fished so many different rivers for the hatch it wasn’t funny… Living out of a pick up truck, and making sure I had enough gas money to get to the next hatch arena, it was fun exploring and visiting other bodies of water to diversify my avenues of engagement on “Da Hex Tour”; all this without interwebs showing me where to go and when to be there! These days, guides are just a cut and paste version of the older, veteran guides up here… And in a way, I do feel sorry for them, as there really are so many more trying to make their mark in a saturated market. 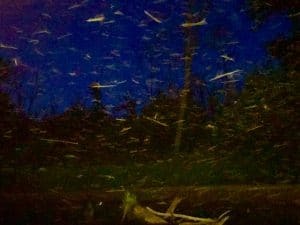 Having the identity of a Kleenex, they like to believe they can keep up, so they would bash any that would like to keep a spot from pluming into a Ausable nightmare where possibly up too a few hundred people might fish the same 8 miles of river each night. Somewhere between wanting to be a guide, and actually becoming a successful one, they have no sense of adventure or individuality so they do the most dishonorable thing any one angler could do to another in haste of their situation, and that’s publicize and poach another person spots, which is unforgivable, yet almost kind of expected from certain personalities. Hex Hatch is no big secret, and it goes without saying that these areas will certainly be exploited via the chatty kathys, haters and wanna bes that need to justify why they themselves are just sheep, but that doesn’t mean I have to grin and shake hands with people with such inferiority complexes and lack of respect. In the future, we will exploit these practices and those that do think they are entitled to do so via the same instruments they use. Seems comical to me how few guides actually get the job done with such ease as the hatch allows, and it tells me that these so called endorsed guides should spend more time learning a dead drift in daylight before attempting it in the dark, because they must be doing something seriously wrong to come up as short as they often do, even when they themselves can’t convert. How do you expect to teach others you are being PAID to teach, if you don’t understand most aspects yourself? Is this your second or third Hatch now? Do you see now why I chose never to fish with you again following just one walk in the dark? Didn’t I take your dad on a dozen guide trips the year before you became a guide so to give you a better handle on things? You want some real truth about the hatch… There it is! Here in Baldwin that the bar for being a guide is much like a limbo stick… Get’s lower and lower each year! We would be hard pressed to produce another Zimmy Knoph, Walt Grau, or Jac Ford in the near future… Newer up and coming guides are just cut and paste versions of the posters they had on their wall. Finding ones own path, or beat isn’t as trendy and just seeing something work, then being shown, then pasting it to their program and screaming “I’m The Best!” News flash dudes… The Wheel Was Invented Long Before You Or Me, and it’s going round with or without us. This sport isn’t quite trendy enough yet for you to add the 90210 to the equation, and point of fact, all we are all just a bunch of Tri Lams. Sit back, and just enjoy the fisheries we’ve shown you, you don’t need to do anymore leg work as that would take a bit of prowess, which you are lacking… But, for the love of Mary, don’t try and justify your intrusion or the impending lights you would bring to the taboo & specific fisheries, it makes you look weak and inferior while being ignorant in your perspective, and there isn’t ONE veteran Hex angler in this state that would agree with your politics over mine. Just go ahead and ask the next old timer you see standing in the weeds if its OK with him if you exploit the spot you found him in simply because it’s getting a little busier and the river is public, and we should just tell everyone the when, where, and how of it all… I’ll bet with the lights low enough, and you still being young enough, the punch would still connect! You have fun out there… I’ll let the veteran Hex fishermen out there know how you feel… They should be real warm and fuzzy with ya in the dark!